Changing careers is one of the most daunting missions I have undertaken in many years. I am excited and nervous. I am confident and hesitant. I am many things, but alone is not one of them. Since focusing my attention on preparing for my next career, I have been amazed by the number of people, organizations, and companies demonstrating such an eagerness to help. 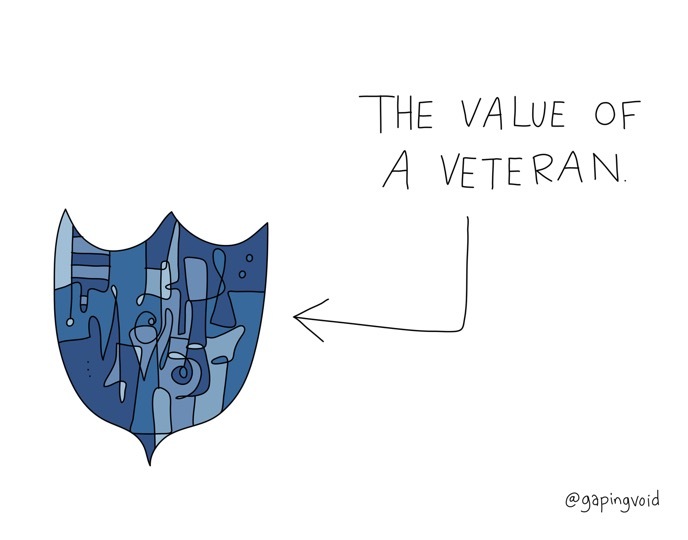 Over the last few weeks I have participated in veteran forums at technology companies here in Silicon Valley, I have benefitted from the coaching of newly formed companies focused on helping current and future veterans navigate the transition, and I have had countless mentorship sessions with senior people in the private sector doing more than their part to help me get this right. I have watched many others transition from military service to civilian life. I have seen some be extremely deliberate about it and I have seen others be rather nonchalant. Having been intimidated by the thought of it, I have always done what I could to give others the opportunity to make the transition a priority. In my most recent job, I relieved my extremely dedicated Executive Officer two months prior to his last day at the Command from his duties. Though we all valued him a great deal and I consider him a friend today, he deserved the opportunity to let go a bit early and set himself up for success in civilian life. Most of us in the military are wired in such a way as to sprint to the finish and hold on as long as possible. Doing so puts us in a position where we just aren’t properly prepared. The resume isn’t done, the LinkedIn profile is an afterthought, and the outward focused network isn’t what it needs to be. When it comes to getting this right, it’s best to let go a bit early so in favor of sprinting to the finish, we turn our transition trot into a responsible pace so that we can effectively merge with traffic on the other side of the intersection. Because most of us won’t give ourselves permission to let go a bit early, it’s paramount that those of us with the requisite authority, give those transitioning every opportunity to know that their focus ought to be preparing for the future in favor of holding on to the present. My primary feelings when deciding that it was in fact time to retire from military service were nervousness and hesitation. More than anything, it was the fear of leaving a team that I have grown to love so dearly and the assumption that I was alone as I contemplated the next adventure. Over the last month, it has become increasingly clear that the support group is even bigger on the outside, the value private companies place on military veterans is amazing, and the programs in place to help ensure we get this right have never been so plentiful. I’m excited. I’m confident. I’m grateful. And I’m far from alone. How do you prepare for significant life transitions? How do you help others navigate their exit from your team? How aware are you of the massive amount of support out there?